Got up at 5, had breakfast at six left, at 7:30 for Jade Dragon Snow Mountain. This mountain is the highest mountain in the Snow Mountain Range with an elevation of 5596 meters (18,355 feet). The mountain has three cable car gondola systems that go up to different elevations on the mountain. We went up on the one that let us off at 4506 meters (14,757 feet). At the foot of the mountain we outfitted ourselves with a warm coat for Carol and two cans of oxygen then got on a bus that took us higher up the mountain at 3,356 meters (10,990 feet). 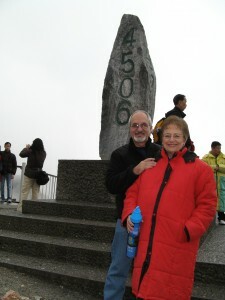 Our goal was to reach the top of the climb at 4,680 meters (15,327 feet). There are stairs with benches and some refreshment bars selling energy drinks, oxygen, water and food along the way. Your stamina and breath disappear very quickly. The weather started out very poorly with rain (clouds) the whole way up on the gondola. It drizzled off and on as we started our stair climb. About half way up Carol couldn't continue so our guide returned to the foot of the stairs with her and got her stabilized and drinking a sweet cocoa coffee. She urged me to continue and with a little reluctance did. I had to make frequent stops and the oxygen was a big help. The Chinese people were/are a very warm and friendly people and greeted me (after a short stare). I frequently was asked to stand with one of their party to pose for a picture. Most often, in broken English, they thanked me and wished me well. Well, I did make it to the top and waited for my cousin and his wife to arrive. While I was waiting the sun came out, the clouds cleared from around the top of the peak, reflecting off the glaciers coming down from the top. What a site. Non-stop pictures. And more requests to pose with the Chinese tourists. I finally started saying "No more." I bought a gold medal engraved with my name, date and elevation engraved on it. 30 Yuan (About $3). Now the long trek down. Again the people were very open and considerate. Some even walking with me and providing support so I wouldn't slip on the wet wooden stairs. I didn't need any help but was touched by their concern. When I got back to the Gondola station my concern was for Carol. She was pretty much recovered. Her lips were still a little blue so I asked her to OD on the oxygen and the blueness quickly went away. We descended back down to the base station and boarded a tour bus to a lake that is fed by the glacial run off. Typical of Glacial lakes it was a greenish blue color. Touristy yaks were giving tourists rides across the river. After a light (???) lunch of Yak meat, wild boar, several vegetable dishes, followed by buckwheat pancakes and bamboo rice we started for Tiger Leaping Gorge. The road was winding and narrow at time very bumpy and passing at your own risk. For a stretch of the road there were farmers selling the current crop of Peaches (very large) and apples. We got some and continued on with our journey, arriving at Tiger Leaping gorge in about two hours. There we met our new tour guide who is Tibetan minority. 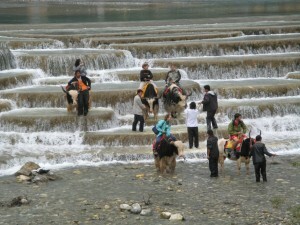 See the story about Tiger Leaping Gorge. It is a beautiful gorge cut between two of the highest peaks in the Snow Mountain range, Snow Dragon on the south and Haba on the North. A very nice stone path has been carved out of the side of the gorge that was level and only about 5 km roundtrip. We hiked to the stone that the tiger was supposed to have leaped in order to cross the gorge. The view of the gorge was very beautiful and worth the side trip. We then began our next leg of our Journey, to Zhongdian (Shangri-La). It took about two hour arriving after 7PM. We quickly checked into our hotel and went to get a light bite to eat (it was this time) consisting of roasted yak, mushroom, and three different plates of vegetables and rice. Now it is time to try to catch up on some much needed sleep! This magnificent 35km-long (21-mile) mountain range framing Li Jiang is a must-visit. The tallest of the mountain's 13 peaks is the daunting Shanzifeng (Fan Peak; elev. 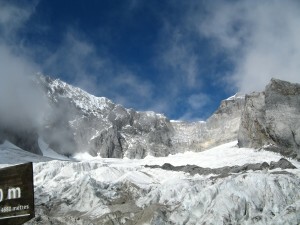 5,596m/18,355 ft.), perennially snowcapped and climbed for the first time only in 1963 by a research team from Beijing. Today's visitors have a number of options for exploring the mountain. All require you to pay a ¥60 ($7.50) entrance fee to the Jade Dragon Snow Mountain Scenic Area, about 30km (20 miles) north of town. Many tourists visit as part of an organized tour. To get out here on your own, it's best to hire a private car or taxi for ¥100 to ¥150 ($13-$19), or take a bus for Baoshan or Daju.Yulong (Jade Dragon) Snow Mountain Yulong (Jade Dragon) Snow Mountain, located 15 kilometers north of the county seat of Lijiang, is a national-level scenic area. Yulong Mountain is the southern section of the Hengduan Mountains. It has 13 peaks, stretching 35 kilometers from north to south. Shanzidou, the main peak, is 5,596 meters above sea level. It is a snow-capped mountain and the southernmost mountain with snow capped all year round in the Northern Hemisphere. Yulong Snow Mountain has rich vegetation coverage, featuring distinct and complete alpine vertical ecosystem from subtropical zone to frigid zone. During the World War II, pilots of American air force found that there was a beautiful paramedic silver seamark on the Route Hump. It was so clear that pilots could see it hundreds of miles away. That is the main peak of Jade Dragon, Shanzidou. There are still 19 glaciers in Jade Dragon Mountain. They are the southernmost glaciers on the Eurasia in modern time. The glaciers were formed when the influence of oceanic monsoon. Usually, glaciers can only be found in high latitude areas. However, high elevation and abundant precipitation made it possible for glaciers to appear in this mountain despite its low-latitude site. The Naxi people take the nature as a huge temple while mountains are the columns. 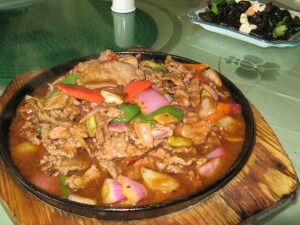 There are two mountains believed the most important for the Naxi. One is the legendary Juna Shiluo Mountain. It is believed as the final dwelling place for people's souls. Another is Jade Dragon, the spititual prop of the Naxi. The God of Jade Dragon, Sanduo, is the greatest protector of the Naxi people. In the Tang Dynasty, the king of Dali, Yi mouxan, in the ceremony of worshiping the Great Five Mountains, granted Jade Dragon as the North Holy Mountain. He also ordered people to build a temple at the foot of the mountain for worshiping the God Sanduo. Glacier Park The Naxi people divide snow-mountains into white, green and black. The snow-mountains with glaciers are green ones. There is a big serac forest in the areas with an elevation of over 4500 meters in Jade Dragon Snow Mountain. In the daytime, with the rise of temperature, the snow covering the serac melts and ice with light green color appears. Together with bright sunshine and blue sky, the seracs will shine with green color. Thus, we can see the spectacular sight of "Green Snow." Tiger Leaping Gorge (Hutiao Xia) It is on the Jinsha River of the upper reaches of the Yangtze) is located 105 kilometers south of Zhongdian County. The gorge is 17 kilometers long with a drop of 213 meters.? The gorge is divided into three sections: Upper, Middle and Lower Hutiao. At the narrowest spot the river is only 30 meters wide. The mouth of the gorge is 1,800 meters above sea level. The river is flanked by Yulong and Haba snow mountains, with a height difference of 3,900 meters. It is one of the deepest gorges in the world. The most popular visit is a round-trip cable-car ride for ¥180 ($22) from the village just inside the main gate to Bingchuan Gongyuan (Glacier Park). If possible, purchase your ticket in town the day before at the Jade Dragon Snow Mountain ticket office at Xianggelila Da Dao and Xiangshan Dong Lu, as ornery ticket attendants at the reception center will sometimes insist you cannot purchase a ticket on the spot. Buses for ¥10 ($1.25) round-trip will transport you the 4km (2 1/2 miles) from the reception center to the cable car terminus. From here it's a two-section ride on a chairlift to the foot of Fan Peak. 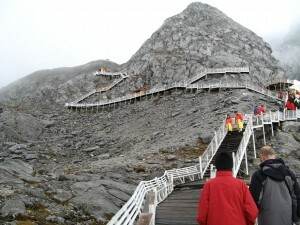 You can climb a wooden walkway all the way up to 4,480m (14,700 ft.), where visitors are greeted with a stunning view of glaciers and with ice caverns. If you feel any altitude sickness, Chinese vendors will happily sell you an oxygen bag for around ¥30 ($3.75). Upper Tiger Leaping Gorge Flowing through Shigu Town, the Jinsha River is flanked by the Yulong Snow Mountain to the east and the Haba Snow Mountain to the west. From the top of the Yulong Snow Mountain to the bottom of the gully is a drop of 3,700 meters, making it 1,800 meters deeper than the Colorado Grand Canyon, while the Haba Snow Mountain slopes gradually in its upper regions and is steeper further down. The mountain is 5,396 meters above sea level and the lowest point on the bank of the Jinsha River is 1,550 meters above sea level. The two mountains flanking the Jinsha River form a 15-km Gorge -- Tiger Leaping Gorge, further classified into the upper, middle and lower Tiger Leaping Gorge. 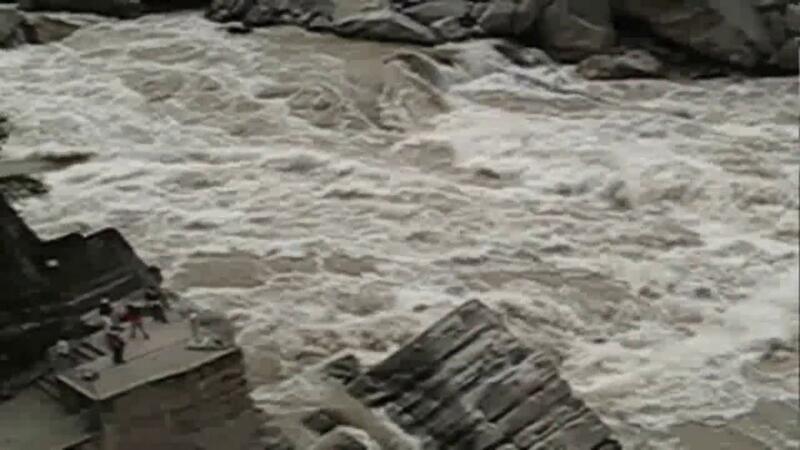 The Upper Tiger Leaping Gorge is the narrowest section, and in the center of the river is a huge rock called Tiger Leaping Rock. It is said that a tiger once leapt from the east bank, clearing the rock, to land on the west bank, hence its name. Middle Tiger Leaping Gorge The most perilous section is the Middle Tiger Leaping Gorge, which features a huge drop in water level. Six km away from the upper gorge is a waterfall where the river crashes down over 100 meters hitting the rocks in the river bed and creating violent currents. In one 100-meter section are numerous reefs, and the current is torrential. The gorge is rarely traversed by humans, but on the slope between the Middle and Lower Tiger Leaping Gorge there is a small village -- Hetaoyuan Village, which has little contact with the outside, and where villagers lead a simple and natural life, dwelling in stone-plate houses. Lower Tiger Leaping Gorge The most important sight in the lower gorge is the Feixing Rapids, from which people can look down on the unconstrained Jinshajiang River. A 32 km long road from the Haba Mountain to Jiangbian Village has been opened to traffic, but traveling on foot is much more interesting.